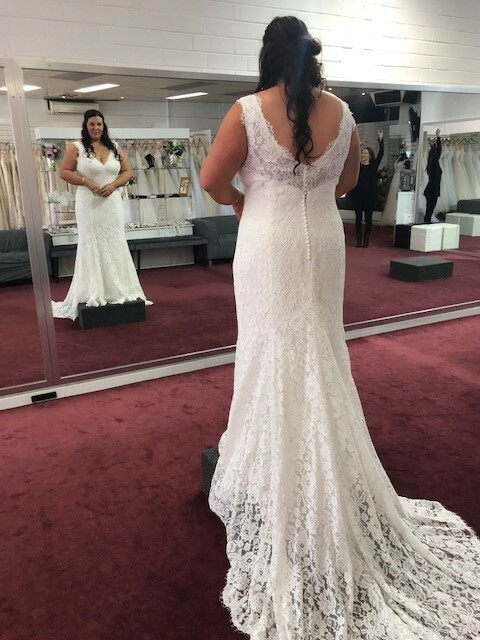 This gorgeous lace dress by Mia Solano: LUV Bridal website description LAKEN, has never been worn with zero alternations to this dress to give you freedom to alter if required. Dress size tag is a size 22 however my every day size is 18 with a bra size 16F. This V neck dress fit perfectly with a zip up V back lined with elegant buttons, I personally think the back was very flattering. The dress compliments your curves and has some boning to help create the mermaid silhouette. Selling this dress as I had a change of mind and went with a completely different style and colour, needless to say this dress is absolutely stunning, timeless and elegant. I would love for this dress to bring happiness to someone else on their big day. Dress bag included with sale. This dress took 6 months to be made and arrive, save yourself time and buy this dress today! Happy to answer any questions please just email me and I will reply ASAP. Once you send a message, Kaylah can invite you to purchase the dress.